I wrote yesterday about the best laid plans - MY plans that obviously weren't what God had for me - and Mike's plans - well, everything is on hold for him for now. Obviously we had to deal with Mike's problem today. He woke up in some serious pain - it wasn't "everything's ok" like he had hoped it would be. Today we went to the doctor. 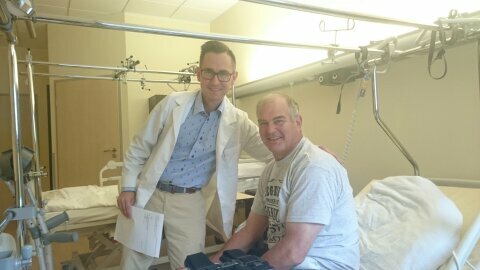 We returned back to the same hospital where my husband had had an osteotomy on August 23 on this same left leg. We thought we were going to just have to go to the ER and wait on the orthopedic surgeon. He came at 3 pm - so we planned on that. In the meantime, I wrote a Facebook PM to Mike's doctor that did his original surgery. This man speaks excellent English and is currently in FL learning and working beside a renowned surgeon who builds bones into the legs of kids who are born without bones in their legs. - in other words, they are born with legs - but no bones inside - usually the child has to undergo amputation. That's how good Mike's doctor was. He is learning from this surgeon who is either only one who does this, or one of only a couple of people in the world who do it and wants to establish this type of hospital here in Poland for Europeans to come to. Anyway, Mike's surgeon, actually saw my FB message quickly and wrote back right away to me. He wanted to know more information and I sent him a couple of pictures. He then wanted to know more details. I told him we were going to go for xrays in the afternoon. I asked about the name of the doctor who is taking his patients for him while he is in FL since we couldn't remember who we should ask for. One of the security guys saw how I was struggling with Mike when we arrived as he tried to unload from the car using only crutches. He brought us a wheelchair to use. It was very nice of him! Kudos to this security guy! He contacted a doctor at the same hospital where we were going to go to the ER and made an appointment for us directly with her. This is also a young doctor - my guess - about 30 - who actually specializes in upper limbs - shoulders and arms - not legs. So we hopped in the car and headed to Warsaw. Not. We slowly made our way down the stairs and with a lot of pain Mike got in our small borrowed car because both of our vehicles are in for repairs - and I drove us to Warsaw to the hospital, Medicover, in Warsaw. The doctor, Joanna, was waiting for us and saw us shortly after we arrived and paid for the visit. It is kind of strange to me to pay up front - but that's how they do it here at this hospital. She heard our situation, having talked with Dr. Deszczynski from Florida some earlier in the day. She then approved Mike for xrays and we headed over to that section of the hospital. While I was waiting for an x ray this is the table that was just in front of me. 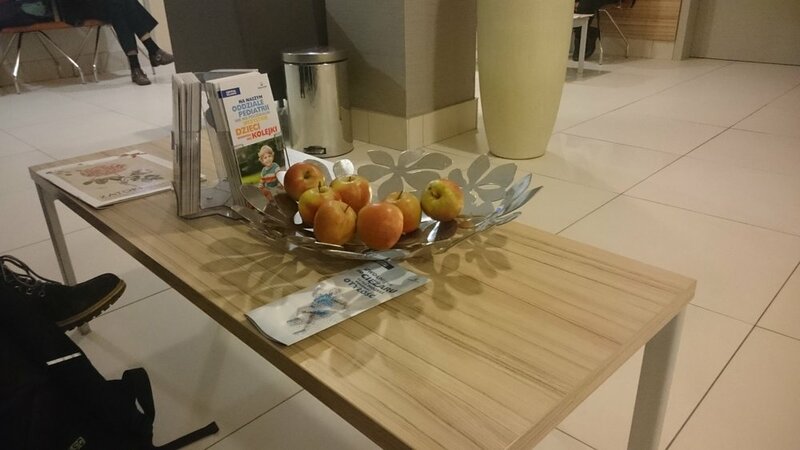 I thought it pretty nice that they offered apples to snack on. NO CHARGE! People could just take and eat an apple as they wanted. Yes, apples are plenteous here! As far as x rays go - today was pretty slow as the x ray technician seemed to be busy doing something else for at least a half hour and she wasn't around. I had taken the quilt top I finished last weekend with me, in order to use the time while I was waiting around the hospital. After completely finishing the top, I decided to take off the outer crumb border and put a black border in between the gray border and the crumb border. I got the whole border taken off while waiting - first for the x rays to get taken and then secondly, for the first 20 minute treatment of Mike's leg with the exogen machine. It's all off now -the crumb border, that is! This may be the first selfie I've ever taken. It was hard to do it with one hand holding the seam ripper and one hand on the camera. Guess I'll need more experience. This is while I was waiting for Mike to get an x ray. He was waiting over close to the x ray room. He was sitting in the wheelchair so he would be first in line at the door. After the x rays, we saw the doctor again. We saw that a bone is broken. With very, very careful treatment, he may be able to get by without further surgery - as the bone is currently in position and just needs to re-heal. Mike's leg is in a brace at 0 degrees (straight out) and has to leave the brace on 24/7 - something he says is very uncomfortable. She told me to bring him back to her if he needs to hear it again any Thursday as she is there at that hospital then. She then instructed us to use this special machine called an Exogen machine daily for 20 minutes. It is supposed to help rebuild bone growth. According to the physical therapist, it really does work. So, Mike and I went back to the entrance area of the hospital and saw another person about the rental of this machine. While they wrote up an agreement for the rental, we were directed to the physical therapy area of the hospital where Mike was instructed on how to use it by a physical therapist, Asia. This same young lady who showed us how to use it had helped Mike a few times after the surgery back in August/early September. This time, she not only worked with Mike on the machine - showing him how to use it, but actually walked with us out to the car where she and a security guy helped Mike get back in the car. It's a small car and hard for Mike to fit in it with his leg brace locked in at 0 degrees (straight out). The hospital has a driveway where drivers can get the car close to the front door so that hurting passengers do not have to walk all the way out to parking. We got home about 7 pm. We had left home about 2 pm. Mike is feeling better today. The swelling appears to be down somewhat on the leg where the issue is- so that's a big praise. I know that most people get tired of physical reports, so this will probably be all that I write about this - unless something truly unique happens (with pictures) that could then be described as a cultural post! 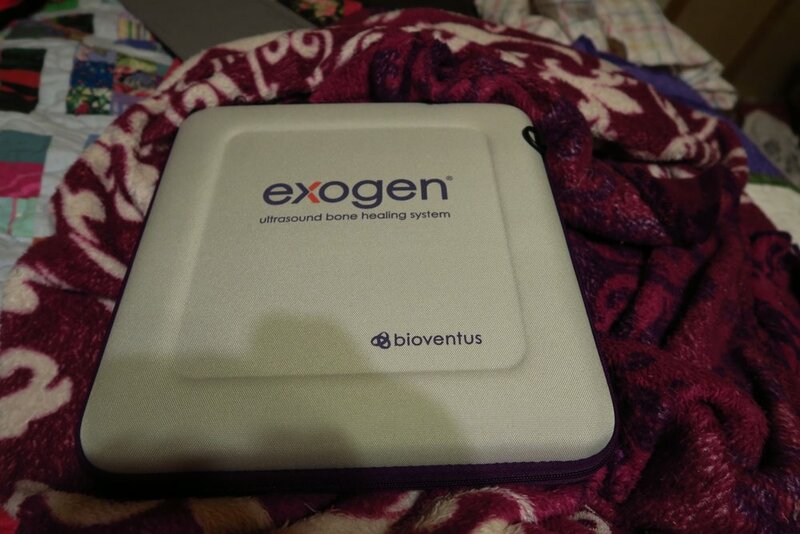 This is the inside of the Exogen box. The machine is the white thing. it is a piece of medical equipment. It's based on ultrasound technology. The hospital where we went, Medicover, is known as the best hospital in Poland. How does it compare to a US hospital? Well...the reception area seems a bit unorganized and unorthodox to me, but they are certainly helpful once you get their their attention. The x ray technician actually came out the door while I was waiting, working on taking the border off my top, and told me they wanted me at reception. I gathered up my quilt top and stuffed it back in the reusable shopping bag and went to reception and asked them what they needed (after I waited in a line of about 5 people). I hadn't seen Mike even come out of the x ray area - figured I had missed him somehow. Anyway, the girl at reception wasn't sure what was going on, but she told me I owed 117 zl for the x rays, so I paid that. Then I asked, "So is my husband finished with his x rays?" I hadn't seen him since he went in the door where the x rays are done. She told me he was, so I asked, "Well, where is he - do you happen to know?" She called the doctor who was waiting for us to come back and see her - and no, he wasn't there. Then the reception girl walked down to x ray and found Mike - back where I had been waiting for him! That's the kind of thing I'm talking about when saying that it is a bit disorganized (to me). I will admit I've not had a lot of experience with US based hospitals except for random births and a visit or two to my dad towards the end of his life. Other than that - my experience with hospital stateside is limited so my comparison may be a bit less than stellar. Oh, and are you curious about the cost? Well, the doctor's visit cost us 250 zl - at the current exchange rate makes that $70. The two xrays cost us 117 zl - which is $32.60. Parking would have cost 6 zl or $1.67 but I didn't have that much change on me and the machine wouldn't take my credit card so they just overrode the code and said it was paid and I was able to get out without paying. That was okay because one other time their machine had "eaten" my money and I had lost about $1.40 in it - but I didn't have the energy to go try to get it back from the front office. Our insurance only covers hospital stays, so this is just paid for by us. And this isn't a co-pay - that's the cost. I'm not complaining. It is costing about $8.33/day to rent the Exogen machine that is supposed to help with the healing of Mike's leg. If it makes it possible to not have to have another surgery, it is money well spent! This is just to prove that I got the border off! And the cat decided that he needs to sleep on it - of course. And that's all today from our part of Poland. It's not major compared to what's going on in some people's lives right now, but it's more drama than I normally have! And don't forget - if you need something for your current sewing project, be sure to check out my sister's storefront! She's got lots of goodies for you - and great prices!